We're in Newberg, Oregon and the Teens of Steel arrive to meet Superman. Right before their eyes, he strips off and becomes Clark Kent. 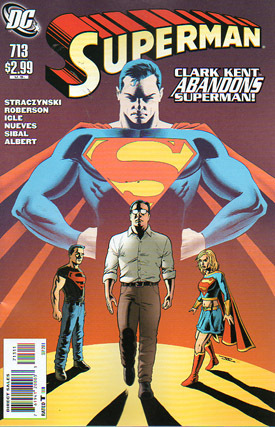 He decides he can still do the odd good deed in secret as he had done in the past but the Superman identity isn't needed any longer. Leaving his Superfamily behind Clark heads into Portland and a Sundoller Coffee shop. While writing his coverage of Superman's 'demise' Clark checks in with Perry. One of the Sundoller baristas notices the story headline Clark is typing up and points out a local fan. The fan is stunned by Kent's story and points out that nobody who really knows Superman and his connection to civilization could ever write such an article. Reluctantly Clark follows the man through the town. First they ask the opinion of a child if Superman scares him. The boy responds telling them that Superman is the ultimate force for good. Clark dismisses the child's opinion, pointing out that youngsters are also impressed by tanks, jets and guns. So the local man approaches a woman with the question: Do you fear or distrust Superman? The woman tells them she admires Superman for his representation for truth after he revealed the truth of his alien origins to the public. Again Clark rebuffs the opinion so another civilian offers an opinion as to whether Superman ever goes too far. 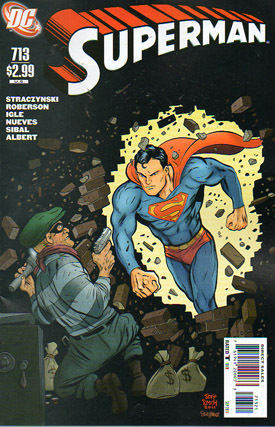 The next man remembers a time Superman intervened to stop a mass murder at an elementary school. Despite the horror of the crime, Superman stood for justice. That kind of strength of character is something many humans would struggle with. Clark finally gives in after being told of his alter ego's representation for Truth, Justice, Liberty, Happiness and the American Way. Superman realizes people NEED that symbol, they NEED Superman. Out of nowhere Clark hears Miss Jennings screech for Superman. At a nearby cafe a few customers are watching the news live from an internet tablet. It seems Jennings has revealed herself to be super powered and is holding Lois Lane hostage in Seattle. Time for Superman to get back in the game. I am, like yourselves, a Superman fan. I don't need a re-education on 'why the world needs Superman' and that's exactly why this story has always failed - it serves the wrong audience. Continuity too is completely messed up - Superman's years from Martha's scrapbook were erased from existence after Secret Origin and Superman & The Legion came in to replace Man of Steel. So too Clark's novel Under A Yellow Sun wasn't written, yet here we are referencing it... Then we have Reign of Doomsdays - Superman abandons his walk in it to save Team Steel yet somehow that hasn't happened here. The damaged relationship with Lois was fixed in Reign of Doomsdays yet here Lois is still deliberately distancing herself after Clark threatened her. I guess since we're rebooting in a matter of weeks they really don't care about continuity anymore, bizarre considering what they try to force feed the fans here. This storyline is nothing more than a two parter that has been exasperatingly overblown. P.S. I can stretch imagination but where the heck did Clark hide the laptop? Art - 3: The art chores are valiantly upheld. The shield sporadically changes from the classic design to the new one so maybe there ought to be some company-wide character models introduced, but over all everyone from the long list delivers. The shield and costume fluctuations are my only gripe aside from my usual nag about flipping between artists. It really divorces the reader from the book when you do this DC. Cover Art - 2: Isn't this a Marvel comics homage? I'm not going to dig them out, but Spider-man and the X-Men have done and redone this cover so many times over the years. Forgiving that is hard but making the Teens of Steel into children? No thanks. You'd also think after 14 months of walking Clark would have lost a bit of weight! Cover Art (Alternate Cover) - 3: What a bizarre cover... Despite its avoidance of referencing the issue content it is strangely, very cool in a retrospective way.